You bring customers to us and we pay you a 50% commission for every purchase they make for lifetime, not just for the first order. 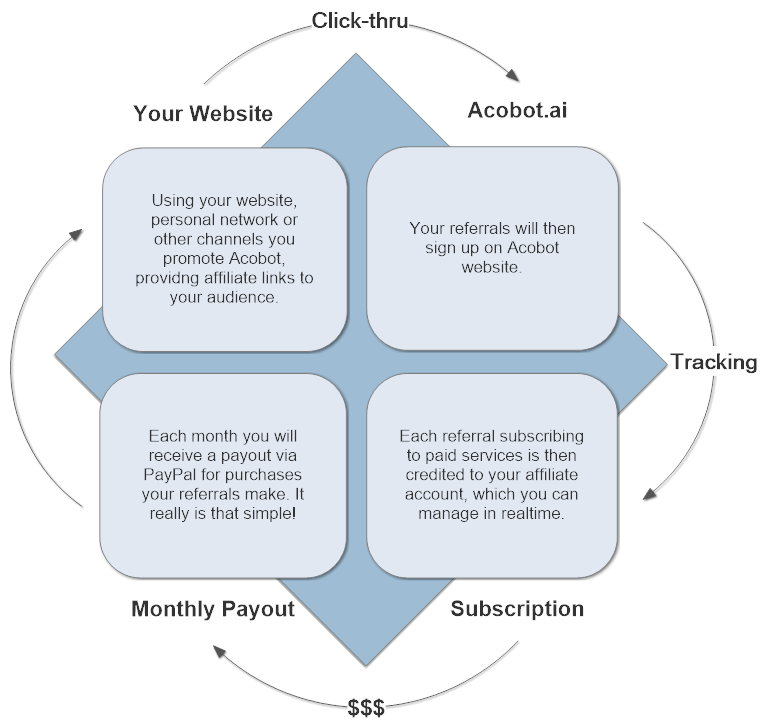 If your customers or audience sell online, you can help them by introducing Acobot to them. They will thank you for the improved bottom line and you will earn with the referrals. If one lands on Acobot website through your referral links and signs up within 90 days, s/he is credited to your account. Our standard commission rate is 50%, which ranks top among the most generous affiliate programs. The customer referrals credited to you are valid permanently. You get paid for every purchase made by the customers you refer, forever. Join and start making money today! You will receive the payment through PayPal on a monthly basis. You will receive a unique ID after signing up with Acobot. Your ID included with the referral links enables us to precisely identify the customers you refer. You may distribute the links with web pages, email, twitter or anything supports links. We use advanced technologies to track your referrals precisely. You will receive detailed reports, covering all of the major customer activities from landing, registration to payment. The reports are in real time so you can verify the data easily. The customers you refer will try out Acobot and then sign up for usage based monthly billing subscription. Each time they pay us, 50% of the amount is credited to your account. You will then receive payment through PayPal each month. There is absolutely no cost for you to be an Acobot affiliate and the earning potential is substantial. On average a customer pays us around $50 each month. That means you can earn $300 a year for each referral. Let's do the math. Note you're still eligible for commissions as long as customers pay after three years. Selling A.I. can be a million dollar business!